Since school is out (yes, teachers look forward to that, too!) and I have a major pack trip coming up later this summer (more about that later) it is time to get serious about whacking the old body back into some sort of shape. Although I’ve always felt that the best conditioning for backpacking is the first three days of the trip, as I get older I find that I’d rather start those first three days from a little better position if possible. So, today I decided on a “conditioning” hike that pushed me both in terms of dealing with heat/sun and climbing. I started at the New Almaden entrance to the Almaden Quicksilver County Park and ascended past English Camp by way of the Deep Gulch trail. Deep Gulch is a less-used route that has the disadvantage (or, for my purposes today, the advantage) of being rather steep but on a hot day like this the fact that it is in a, uh, deep gulch means that it is also very shady. After English Camp I continued on past the site of the old mill on the ridge via the Castillero trail to join up with the Mine Hill trail, which I followed back down to the parking lot. I certainly do not recommend this route in these conditions to anyone out for a pleasant little stroll. It was 90 degrees when I returned to my car and portions of the hike near the highest point are directly in the sun – and I was there right around noon. On the other hand, it seemed like I had the entire park almost to myself. During the several hours I was there I saw exactly five other people. Since the season is upon us, it seems like a good time to post the link to my article on equipment for backpacking photography – at least for the kind of photography I do while on the trail. I discuss some specific equipment that I use along with some general ideas about equipment and techniques. The post includes information on cameras, lenses, accessories, how to carry the stuff, and compromises you might or might not want to make on the trail. Tom Mangan just posted a description of his Sunday hike at my favorite local park, the Calero County Park south of San Jose. I was there on Saturday (when it was cool and foggy in the morning, Tom… ;-) and he was there on Sunday after the Great Spring Warmup in Central California. Tom hiked on some of my favorite trails in the park, including the relatively remote Chisnantuk Peak Trail, which traverses some of the less visited corners of the park (and in doing so passes over some less maintained trails) and also visits some of the open ridges that provide great vistas of Santa Clara County and beyond. Today, for the first time in almost a year, I heard the sound of running water during my hike in the Calero Hills. Here in dry California that is a special thing! The Mt. Whitney and Eastern Sierra Hiking blog covers almost all things related to hiking/climbing Mt. Whitney. A post (“Mt. Whitney From Horseshoe Meadows“) covers some alternate approaches for those who either can’t or don’t want to use the usual Whitney Portal approach. Army Pass is an old route out of the Cottonwood Lakes area that ascends to the Sierra Crest near Mt. Langley. It is really quite a wonderful and direct route, but it has not been officially maintained for decades. The last time I travelled this way – a couple times over a several day period – most of the trail was in good shape, but a few key spots had been obliterated by rock slides. I recall at least one that made me nervous about the exposure. So, doable, but not for the faint of heart or the newbie. New Army Pass more or less replaced Army Pass and now seems to be more heavily used than the older, unmaintained trail. The ascent of New Army Pass from the east side is one of the most steady and “gradual” of any east side pass I’ve been on. Despite the fact that it crosses the crest (in sight of Cirque Peak) at over 12,000′, it really isn’t a very hard route at all, and you are rewarded by some incredible and open panoramas at the top. Kearsarge Pass and Forester Pass afford a route to the west side of Whitney that starts at Onion Valley. This isn’t an easy route, nor is it a short one, but it travels through some very scenic and alpine country. The trail ascends from the Onion Valley trailhead to cross Kearsarge Pass (just below 12,000′) and then descends to Kearsarge Lakes, a popular first night destination. From here you drop into the Bubb Creek drainage and then ascend to Forester Pass (over 13,000′) on a route that wouldn’t be overly difficult save for the very high elevation. The trail drops quickly from Forester and then travels a number of miles above timberline before finally encountering trees again near Tyndall Creek. In all three of these cases, once you cross the Sierra crest you typically make your way by one or another route to the standard west side approach to Mt. Whitney, though variations are possible, especially if you come over one of the Army Passes. I notice that the authors of the post don’t mention some other approaches. For one thing, they don’t consider the starting on the west side of the Sierra. It is possible to come in over Kaweah Gap and then go up the Kern River before ascending to the Muir Trail. This is a long route, but not that much longer than coming from Kearsarge/Forester. More interestingly, there is no mention of Shepard Pass. Maybe this is a good thing. I’ve been over Shepard once, traveling from west to east at the end of a trip, and I am well aware of why this pass has a fearsome reputation. It starts virtually in the desert of Owens Valley, almost literally at the base of the Sierra, and then it climbs and climbs and climbs, with the depressing exception of a several hundred foot elevation loss midway along the route followed by additional unmitigated climbing. The climbing is often rather steep, and the terrain becomes quite rough in the upper reaches of the pass. Oddly, once you complete this brutal climb and cross the crest near a small stagnant lake, the remaining hike down to the JMT is a lovely little cakewalk through nearly flat and wide open alpine meadow with stupendous panoramic views. * I’m doing yet another Whitney trip later this summer – despite my “decision” a year or so ago to not “do Whitney” again. I’m still not that enthusiastic about ascending Whitney – “been there, done that” – but the rest of the trip retraces a pack trip I took many years ago from Sequoia across the Kaweahs, and I do look forward to covering some of that terrain that I haven’t seen in many years. All text and photographs are © Copyright G Dan Mitchell – all rights reserved. 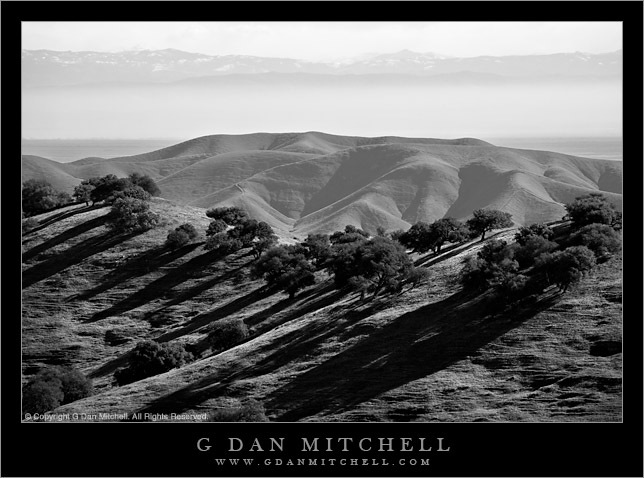 Neither text nor photographs may be used in any form without explicit advance permission from G Dan Mitchell. – There is no escaping the fact that this was a mining site for many years (hence “Almaden Quicksilver County Park”), and I find the ruins historically and aesthetically interesting. A separate page (Almaden Quicksilver County Park Structures Photographs) contains photographs of these subjects. Note: Additional photographs from this park are found here. Poison Oak Leaves. Almaden Quicksilver Park. October 14, 2006. © Copyright G Dan Mitchell. Rocks, Trees, and Grass. Almaden Quicksilver Park. March 18, 2006. © Copyright Dan Mitchell. Diablo Range Snow and Clouds. Almaden Quicksilver. February 18, 2006. © Copyright Dan Mitchell. Oak Arches. Almaden Quicksilver Park. December 23, 2005. © Copyright Dan Mitchell. Late Season Fall Color. Almaden Quicksilver Park. December 23, 2005. © Copyright Dan Mitchell. Tree and Rain. Almaden Quicksilver Park. December 21, 2005. © Copyright Dan Mitchell. Solstice Trees. Almaden Quicksilver. December 21, 2005. © Copyright Dan Mitchell. Prospect #3 Trail. Almaden Quicksilver Park. February 26, 2005. © Copyright Dan Mitchell. Oak Grove and Fog. Almaden Quicksilver Park. October 22, 2005. © Copyright Dan Mitchell. Moonrise Near the Senador Mine. Almaden Quicksilver Park. October 16, 2005. © Copyright Dan Mitchell. Mt. Hamilton and Santa Clara Valley Fog. Almaden Quicksilver Park. October 1, 2005. © Copyright Dan Mitchell. Leaves Turning Colors. Quicksilver Park. September 2, 2005. © Copyright Dan Mitchell. Sunset. Almaden Quicksilver Park. July 21, 2005. © Copyright Dan Mitchell. South Santa Clara Valley from Catherine Mine. Almaden Quicksilver Park. July 19, 2005. © Photo copyright Dan Mitchell. Morning Light. Almaden Quicksilver Park. May 7, 2005. Photo copyright Dan Mitchell. Almaden Quicksilver Hillside. April 2, 2005. Photo copyright Dan Mitchell. Spring Flowers. Almaden Quicksilver Park. March 13, 2005. Photo copyright Dan Mitchell. Fisherman at Guadalupe Reservoir. Almaden Quicksilver Park. March 13, 2005. Photo copyright Dan Mitchell. Morning sun on oak trees and new grass. Almaden Quicksilver Park. February 26, 2005. Photo copyright Dan Mitchell. New oak foliage. Almaden Quicksilver Park. February 26, 2005. Photo copyright Dan Mitchell. Hillside near Guadalupe Reservoir. Almaden Quicksilver Park. February 12, 2005. Photo copyright Dan Mitchell. Oak and grass covered ridge near Webb Canyon. Almaden Quicksilver Park. January 22, 2005. Photo copyright Dan Mitchell. New Years Day. Almaden Quicksilver Park. January 1, 2005. Photo copyright Dan Mitchell. Photo copyright Dan Mitchell. Sun on a nearby ridge as rain approaches. Almaden Quicksilver Park. January 1, 2005. Photo copyright Dan Mitchell. Rainbow over Almaden Valley. Almaden Quicksilver Park. January 1, 2005. Photo copyright Dan Mitchell. Santa Clara Valley with San Francisco in the far distance. January 1, 2005. Photo copyright Dan Mitchell. Spur trail between New Almaden Trail and Randol Trail. Almaden Quicksilver Park. December 15, 2004. Photo copyright Dan Mitchell. Trees and grass on a small ridge near the Randol Trail. Almaden Quicksilver Park. December 15, 2004. Photo copyright Dan Mitchell. Trees in morning sun at Almaden Quicksilver Park. December 15, 2004. Photo copyright Dan Mitchell. Fog in the Santa Clara Valley. Almaden Quicksilver Park. December 11, 2004. Photo copyright Dan Mitchell. Golden late-fall trees. Almaden Quicksilver Park. December 11, 2004. Photo copyright Dan Mitchell. Oaks and fog on a ridge at Almaden Quicksilver Park. December 10, 2004. Photo copyright Dan Mitchell. Trees and grass on the New Almaden Trail. December 4, 2004. Photo copyright Dan Mitchell. New Almaden Trail. December 4, 2004. Photo copyright Dan Mitchell. Bare branches, fall leaves, and new grass. Almaden Quicksilver Park. November 14, 2004. Photo copyright Dan Mitchell. Peeling bark. Almaden Quicksilver Park. October 31, 2004. Photo copyright Dan Mitchell. Bay trees. Almaden Quicksilver Park. October 31, 2004. Photo copyright Dan Mitchell. Green and brown leaves on the Deep Gulch Trail at Almaden Quicksilver Park. October 23, 2004. Photo copyright Dan Mitchell. Oak tree near the Hacienda Trail. Almaden Quicksilver Park. October 16, 2004. Photo copyright Dan Mitchell. Fall trees near the top of the Deep Gulch Trail at Almaden Quicksilver. October 16, 2004. Photo copyright Dan Mitchell. Mountain Hamilton beyond Almaden Quicksilver ridge. September 18, 2004. Photo copyright Dan Mitchell. Randol Trail #2. Almaden Quicksilver Park. September 3, 2004. Photo copyright Dan Mitchell. Almaden Quicksilver Park with Mt. Hamilton in the distance. August 28, 2004. Photo copyright Dan Mitchell. Randol Trail. Almaden Quicksilver Park. August 28, 2004. Photo copyright Dan Mitchell. Hacienda Trail oaks. Almaden Quicksilver. August 21, 2004. Photo copyright Dan Mitchell. Hacienda Trail. Almaden Quicksilver. August 21, 2004. Photo copyright Dan Mitchell. Catherine Tunnel mine site. Almaden Quicksilver Park. August 7, 2004. Photo copyright Dan Mitchell. Lichen and Leaves on the Castillero Trail. Almaden Quicksilver Park. August 7, 2004. Photo copyright Dan Mitchell. Mine Hill trail in evening light. July 28, 2004. Photo copyright Dan Mitchell. Fall colors near English Camp. Almaden Quicksilver Park. November 15, 2003. Photo copyright Dan Mitchell. Rock, grass, and trees on the Woods Road trail. Almaden Quicksilver Park. June 12, 2003. Photo copyright Dan Mitchell. Dry grass at Almaden Quicksilver Park. June 26, 2004. Photo copyright Dan Mitchell. New Almaden Trail near Mockingbird Hill. April 18, 2004. Photo copyright Dan Mitchell. Rocks, grass, and trees. Almaden Quicksilver Park. April 18, 2004. Photo copyright Dan Mitchell. Oak-covered ridge near Webb Canyon. March 27, 2004. Photo copyright Dan Mitchell. Hillside near the Hacienda entrance to Almaden Quicksilver Park. August 13, 2002. Photo copyright Dan Mitchell. Near the Hacienda entrance. March 20, 2004. Photo copyright Dan Mitchell. Bridge on the New Almaden Trail, Almaden Quicksilver County Park. March 13, 2004. Photo copyright Dan Mitchell. 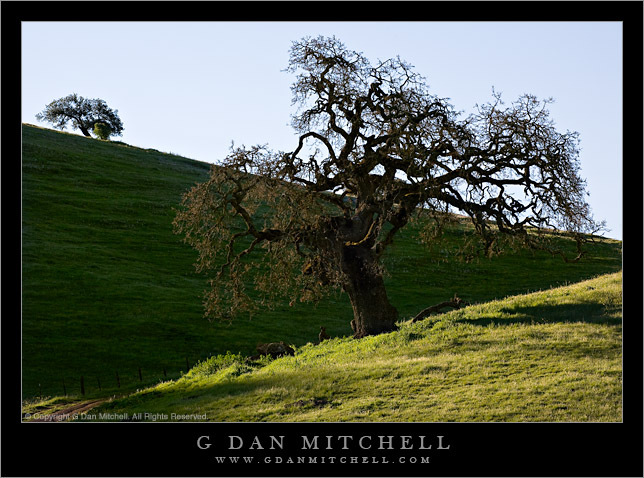 Trees and grass along Woods Road, Almaden Quicksilver Park. February 15, 2004. Photo copyright Dan Mitchell. January flowers. January 31, 2004. Photo copyright Dan Mitchell. Forested section of the Prospect #3 trail. Photo copyright Dan Mitchell. Almaden Quicksilver early autumn leaves in black and white. September 28, 2003.